Join us for an intensive, exclusive, three-and-a-half-day retreat of focused instruction from Jacquie Gering. This small group setting will allow you to learn and grow in your walking foot quilting. Jacquie will begin by reviewing the basics and establishing a firm foundation for expanding and growing participants' skills with the walking foot. With Jacquie's guidance, participants will apply that knowledge to learn and practice walking foot friendly designs from simple to complex. Jacquie will support participants as they use that knowledge to create their own unique designs. 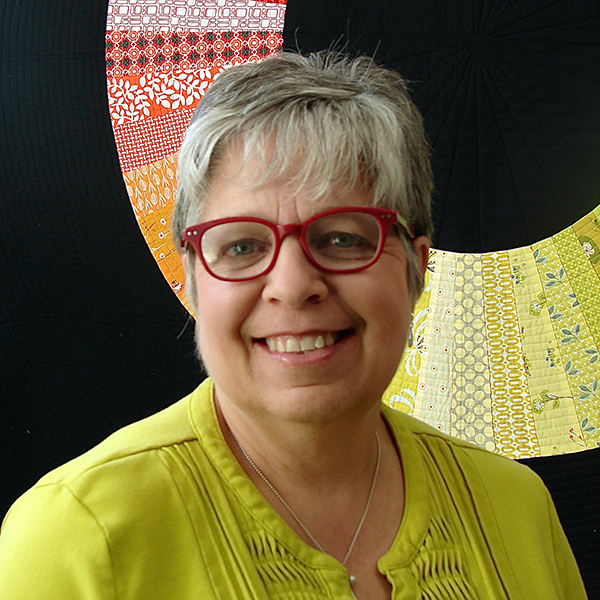 Jacquie will teach strategies for managing large quilts and marking and quilting intricate designs. Together, Jacquie and the group will explore how to analyze quilts to create quilting designs that will support and enhance the piecing. Participants will leave with a toolbox filled with creative quilting options and the knowledge, skills and confidence to quilt their own quilts. 21C Hotel is a beautiful, inspiring space for an intimate, individual workshop experience with new friends. In a supportive environment, attendees will learn to master and design walking foot designs from the simple to complex. With three and half days of instruction and exploration, attendees will learn in-depth design concepts and techniques. Find your room and settle in as your fellow attendees arrive. Join Jacquie in her beautiful mid-century modern home for a drinks, snacks, and trunk show. Transportation will be provided. Order in or go out and explore the area. Check-out time is 11, but the bellhop can store your bags or you can bring them to the workshop room. Your registration includes three and half days of instruction with Jacquie Gering, welcome reception and trunk show at Jacquie’s home, daily breakfast and lunch. Dinners are the responsibility of the participant. Please visit our Refund and Cancellation Policy and FAQ for more details. Companion – would you like to share your hotel room with a friend or spouse? Contact us on meal pricing based on your schedule. The 21C Museum Hotel is a unique boutique hotel that features contemporary art. Nestled between the Power & Light district and River Market in downtown Kansas City this hotel is steps away from everything Kansas City has to offer. This beautiful hotel offers luxurious guest rooms and suites that provide a welcomed sanctuary from the art and activity that fills the 21c galleries. Designed by renowned architecture firm Deborah Berke Partners and KC-based firm Hufft Projects, rooms have high ceilings, contemporary furnishings, large windows, and beautiful original artwork. 21C Hotel is conveniently located in downtown Kansas City, Missouri. The address for driving is 219 W 9th Street, Kansas City, Missouri 64105. Overnight valet parking at the 21C Hotel is $25 per day. Kansas City is serviced by Lyft and Uber. The Kansas City International Airport (MCI) is a brief 20-minute ride from the hotel. There is a variety of ground transportation options to get you to the hotel.